I was kind of in a rush last weekend, just needing to grab something quick at the liquor store on Abbot Kinney on my way home, and wistful for the days when this could be done much speedier. Crossing the street, I heard a guy shout, "We're Streetlight Cadence, from Honolulu, Hawai'i!" There, set up on the corner, was a quartet of gentlemen playing their hearts out for all the foot traffic folks out strolling the boulevard. Their music and their vibe was delightfully retro, and I was surprised to hear that they were from Hawai'i. The more I thought about it though, I wasn't. Here were these young guys all playing their instruments (guitar, cello, violin, accordion), belting it out for all to hear, in a wonderful example of the Aloha Spirit that Hawai'i is famous for (and which I was recently reminded of by Mona to LIVE as an example). I stopped and thoroughly enjoyed a number before I had to speed off, with a little crowd gathering of others whose afternoons had also been made. I love the DIY spirit of creative people like this, and it's something everyone can use way more of. Just get out there and DO whatever it is that you love! 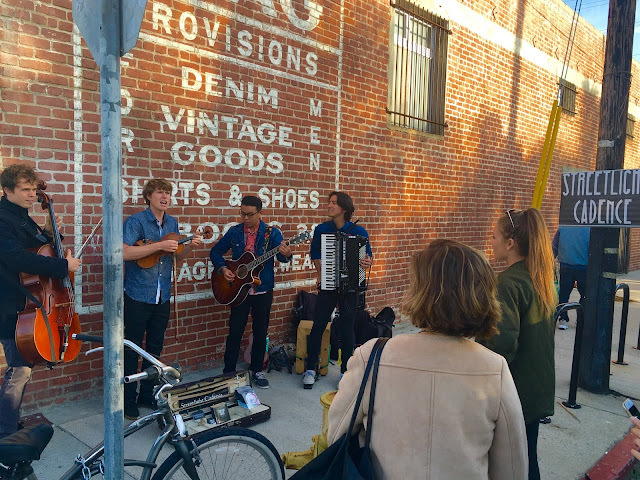 Thank you to Streetlight Cadence for bringing their music to the people, and for showing Venice their Aloha! Cheers, boys!